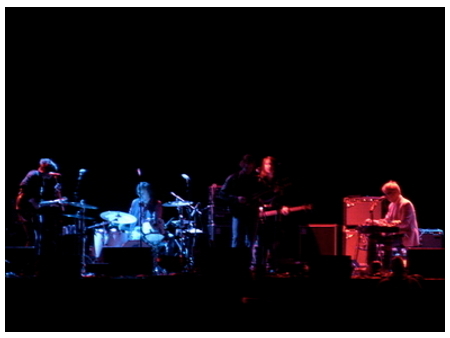 Ryan Adams & The Cardinals on tour… standing on the shoulders of giants. You know, by all accounts, it’s been a different Ryan Adams that has posted on Foggy lately. Having been on tour with Oasis for the last while, it seems like Ryan’s… well… maturing. And healthier than he’s been in a while. And I don’t mean that at all in a condescending way; I mean it in the most awe-inspiring, respectful way. But it’s true… and from the tunes I’ve been hearing, this time with Oasis has only done good for Ryan and the Cards; in all honesty, some of the recordings I’ve heard of this tour are some of the best stuff I’ve heard from the Cardinals in ages. Which brings me to the main point of this post… I’ve been scanning archive.org regularly for new material that’s been posted from the show, and I came across this set from only three days ago, when Ryan Adams and the Cardinals performed at the Bank of America Pavilion. And man, some of the new songs you hear there are, quite simply, awesome, and bode well for the Cardinal’s next release. Here’s a sample of those new tunes… the outstanding “Cobwebs” (which most of us would have already been exposed to by a post on Foggy), “Fix It” (god, how about that refrain? ), and then the brand-new (to me, at least), tunes of “Sinking Ship” and “The Colour of Pain“. All in all, Ryan Adams and the Cardinals are still titans, ladies and gentlemen. An island, a solid place to stand, in a swirling mass of uncertainty. And here’s some evidence of why they remain my favourite band. Here’s to more of this boys. And, thanks to the always spiffy archive.org, I’m now able to embed the entire playlist on this blog, below. Listen to the whole set, and if you’d like to download the whole thing, head here. Seriously. It’s like the first time I heard Ryan Adams all over again, and I’m loving it. Previous Post Zimbabwe’s Song… it needs your voice. Oh my gosh Matt! I’m not even finished listening to Cobwebs, but I’m ridiculous excited. I can’t thank you enough for posting and sharing. PS, I just caught Joe Pug’s Hymn 101 video last night :) I finally get to catch this dude live. Hooray! This makes my day. It’s refreshing to hear some new stuff from Mr. Adams.